1. Warm the oil in a skillet or wok over medium-high heat. 2. Add the chicken, scallions and cornstarch and cook, stirring constantly the chicken is cooked and broken into pieces, 3 to 4 minutes. 3. Add the water chestnuts, soy sauce, ginger, and oyster sauce and cook for 1 minute. Remove from the heat. 4. To serve, take 1 lettuce leaf at a time and spoon a heaping tablespoon of the chicken mixture into the center. Wrap the lettuce around the filling. Serve. Gewürztraminer, pinot gris, or pinot grigio. This is a great appetizer and much healthier than the usual spring rolls. You do need nice large leaves so that you can wrap these up like a cabbage roll and then eat them in your hand. Needless to say, there were no leftovers and that to me is always the sign of a good recipe. 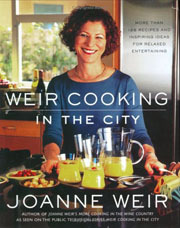 Joanne Weir knows how to take simple ingredients and add just the right combination of herbs, spices, and other accents to make it special. There is not a thing unusual or difficult about this recipe, but it comes together so deliciously, you’ll think you had takeout delivered from the best Chinese restaurant in town—only fresher. This is very quick and tasty, and healthy, too. We’re not big lettuce fans, but this made polishing off an entire head between two people absolutely no problem. The balance of flavors is a bit Americanized, but pleasant nonetheless. The wraps came out well, and this was a quick and easy recipe to follow. I think this works best accompanied by some dim sum, and it’s a great weeknight dinner for the family. The chicken mixture was tasty, and it was fun eating it with our hands. 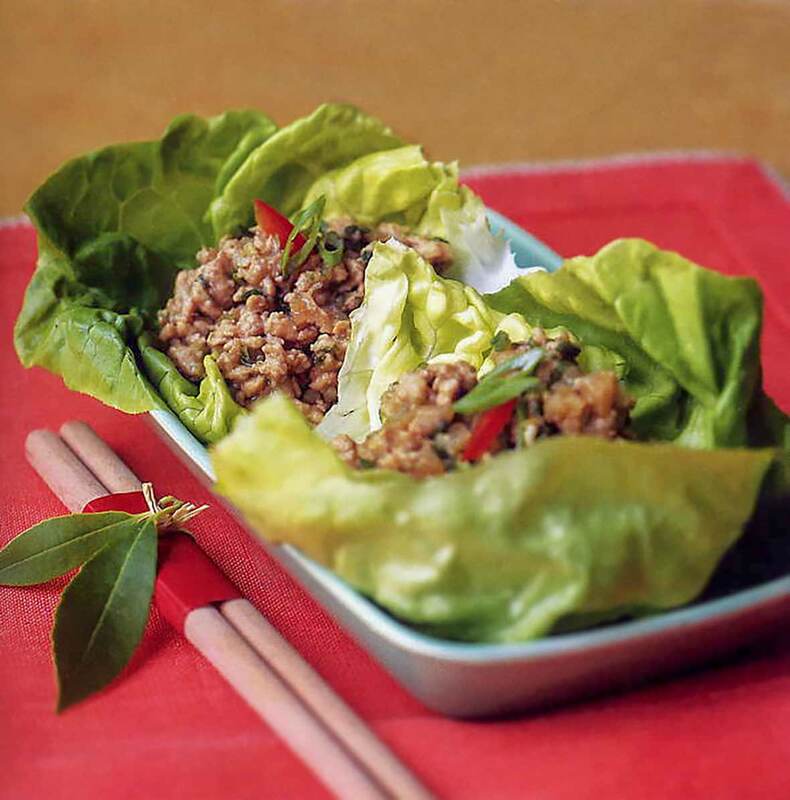 Chicken Lettuce Wraps Recipe © 2004 Joanne Weir. Photo © 2004 Penina Meisels. All rights reserved. All recipes and photos used with permission of the publisher.